BUTTERFLY N SUMMER -Suni's Bourbon and Boweties Inspired - Butterfly Bangle Bracelet With Copper Wire and Butterfly Stone Beads. Sorry, this item is sold out. Have DesignsbySuniAndMore make something just for you, or try these other items. Bourbon & Boweties Inspired Bracelet. White Pearl Wire Wrapped Bracelet. 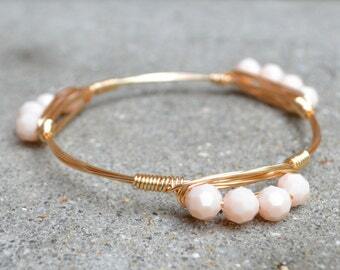 Bourbon and Boweties Inspired Magnesite Bangle. Blue Slab Beaded Wire Wrapped Bracelet(s). Bourbon & Boweties Inspired Wire Bracelet. Gold Pineapple Wire Wrapped Beaded Bangle.